Are your ears trained yet? Have you saved enough for your next producer’s purchase? we give you some top-notch shopping list picks to choose. From Best Headphones (open-back and close-back), 88 keyboards, Drum Machines, Audio Interfaces to Laptops & MIDI Drum-Pad Controllers. Whether you`re up for mixing or mastering session, our “Best Budget Studio Monitors” will take your home studio mode to the next Pro level. If you`re wondering in the back of your mind, how to know if your nearfields aka nearfield monitors are suitable for the directed genre, we`ll point a few key characters. Why nearfield and not far field? 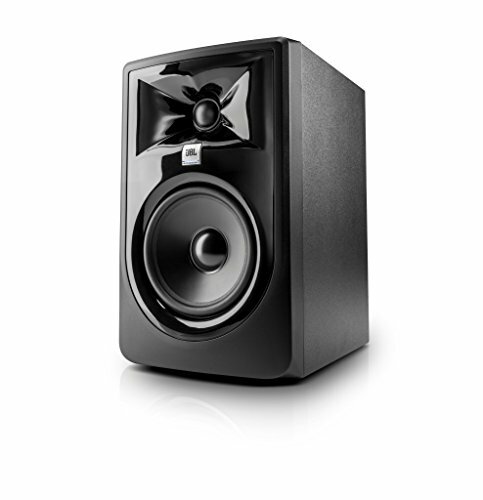 Because, as the title says Best Budget Studio Monitors, and since budget also means you are a home producer and work mostly in a smaller room space, therfore nearfields are all that you need at this point. The main things that you should be concerned about when choosing your personal pair, are much more consistent once you open the box. Most of you are already well acquainted with most of the speaker specs terms, but it`s never too much of information when such a delicate decision like this comes to action. One of the most important features , especially when picking out from the best budget studio monitors, is Frequency Range. Every producer/beatmaker knows that one of the hardest things to mix down are the lows or low frequencies. The kick and bass is every producers sweet nightmare, so your pair of monitors must have a proper frequency to hear the lows. Hip Hop is all about that fat bass and strong, thick kicks. Especially in the Era of 808 symphony, where every other beat contains some sort of filtered fat sub-kick and extremely heavy effected bass lines. On the other hand, it is very hard to put out a piece of professional equipment at low cost to work with catching the frequencies as its much bigger and sophisticated. In our case there is some luck, there are pretty good models under $500 that bring you the range of even 45Hz of frequency response up to 22kHz. Regardless of this characteristic, there are still some things to include in the package with frequency range with best budget studio monitors. That is the Accuracy Level. Your speaker monitors MUST show a pretty much flawless skill of emitting an accurate and precise sound detail, that displays the low end as precise as possible. Why Does Your Speakers Have To Be Flat? The frequency response of your studio monitors must be as flat as it can. Meaning, if the reproduction of any frequency coming out of the speakers is delivered at the exact volume as the original one, you have your self one pretty flat monitor. There are always going to be some problems with your room acoustics, whether you treated your studio or not. But that`s a totally different topic, And should definitely not be your primary concern now. Once your ears are trained theoretically and practically you will know the actual capability of your near-field speakers. It is also important to notice that some of the monitors if not vast majority are aimed towards smaller room studios and it`s only logic since they are near-field ones, so don`t get all caught up in their smaller size. Yes, a bigger driver produces more accurate sound picture, but can also create a lot of problems in a room he is too loud for. A classic 4 to 5 inch drivers are the perfect match. 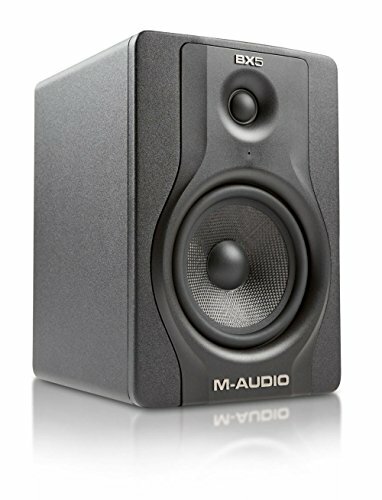 M-Audio BX5 Carbon Black | 5" Single Speaker Studio Monitor with Magnetic Shielding (70-watt Class A/B Power), inMusic Brands Inc. This top rated and top selling audio boxes give flat sound, with excellent reproduction of vocal frequencies and as much quality in the bass and high department too. Durable, compact and their LED indicator dims if you`re not in your producer`s sweet spot. Isn`t that a treat! Now, these are my babies! Although not my studio in the pic above, mine can be seen here, are 100% verified as one of the best in this range. Most natural frequency response eats your room`s dead zones. The lows are more than just pretty impressive, the highs are so much truthful then ever imagined. Can even handle being close to the walls. The three knobs at the back, for Volume, High Filter Level and Low Filter Level Adjustment are a huge plus. One of their best character lines is also some kind of safe mode, where after you turn on the speakers (with of course all volume knobs turned down first), the KRKs won`t give any sound until you reach a level powerful enough for some decent activation. And if not used for some time, the speakers automatically shut down, enabling you to keep that unnecessary power consumption and also keeping you from wasting out the good speaker. 🙂 They come back alive after you play a sound again. Awesome type of hibernation mode. Most of the monitor speakers have their bass ports openings at the back of the chassis. Or don`t own any. But KRKs follow some real knowledge rules. Bass port opening is just below the woofer enabling the appropriate air movement during the low frequency action, so even when close to a wall, KRK RKT5 G3 give the original performance sound. The whole system is called the Bass Reflex. And KRK nailed it. And the last thing, please do your self an instant favor and purchase only the best connecting cables, because KRKs built quality will automatically charge you with bad sound if connected otherwise. I`m currently on basic RCA cables and it hurts me to hear them fighting for a good sound isolation, because of the bad wires. The jacks are loosened up and every slight movment brings hiss to the final reproductive sound. With a string design, impeccable sound quality, durability mode on a highest level and ideal frequency range for the offered price, Yamaha HS5 is a well standing opponent in its class. With low power consumption and avid personality, this pair will make sure you get the best sounding mixing and mastering goals. The only slight con is lack of response in the 50-60Hz area. Mackies MR5s is a versatile pair and maybe not the best budget studio monitors, but can easily compete within the genre. One of their great features include the ability to turn any of the speaker boxes into a right or left channel. Great connectors too. Cool! PreSonus is another of them great audio equipment manufacturers that create and provide an astounding performance products for the tough market. Their Eris 5s give a decent sound display, although they do lack in the bass department, but highs are of the hook. Very good for Beginner Producers. These two have deeper bass response, bringing clear crisp sound, perfect for small room treatment. Very well responsive to R`n`B mixing, extra responsive and dynamic, they are a pretty good challenge competitors in the range between Adam, JBL and Mackes. And they are pretty loud for their size, so really a “no-brainer” here as one of the users mentioned. Behringer knows how to surprise the competition. With their TRUTH 5.25″ active monitors, they fit another best budget studio monitors shoes just right. You can boost them up with no loss of sound quality, meaning no hearable distortion. Silk tweeters give away a nice flat response in the upper frequency spectrum. No fatigue even after 5 hours of play. Best budget studio monitors woudn`t be a valid and adequate rating without one of my most favorite manufacturer brands. The Adam. F5 is not your refresh keyboard button, but it is a refresh inspirational boost when purchasing a pro model studio monitors system. And it`s not so hard to guess the mother country. Germans know their hard work always pays off and with this delicate category, they proved their role more than enough. The twenty-hour work is peace of cake for Adam F5. VL-S5 from Tascam is known for having better bass response, making your mixing an easy game, almost like kids play. Great build too and not to mention excellent price for all the shown quality makes VL-S5 your top candidate for best budget studio monitors. And our last pair that righteously deserves the spot among best budget studio monitors, near-field type, is Numark N-Wave 580L model series. Flat Frequency Response, durable, easy to use and versatile. But not so many users with actual mixing and mastering goals here, most of them are using them just as a ordinary media tools. They are slightly curved towards multimedia desktop speakers and Dj monitors. Either way, for their amazing price per pair, you can`t get a better deal if starting out your business. So, without any doubt, you can be sure that this list is final and you wont get any better choice. It is final for this year and surely for few upcoming ones. These are The Best Budget Studio Monitors under 400$. And it is also very important to be accented that they are near-field ones, as most of them are at this price range. But that`s not the main decisive matter. It`s the budget and the care and awareness for most of your struggling artists, producers mostly, who work their backs hard every day to keep the passion alive. My personal no. 1 and no. 2 spots go to KRK Rokit 5 G3s and Adam F5s. But, every other piece presented here will show exquisite performance as well. Get your best budget studio monitors shopping tour now! Fire bills away!